“Travel with Rick Steves” is a fun, hour-long, practical talk show with guest experts and questions from travelers. This weekly program is a lively conversation between travelers and the experts as we learn to explore our world smartly, smoothly, and thoughtfully. Rick Steves grew up in Edmonds, Washington and studied at the University of Washington where he received degrees in Business Administration and European History. But his real education came in Europe — since 1973 he’s spent 120 days a year in Europe. Spending one third of his adult life living out of a suitcase in Europe has shaped his thinking. 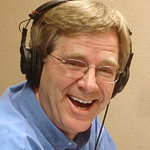 Rick Steves writes European travel guidebooks and hosts travel shows on public television and public radio. Error: Error validating access token: Session has expired on Friday, 08-Feb-19 11:36:11 PST. The current time is Friday, 19-Apr-19 15:14:06 PDT.